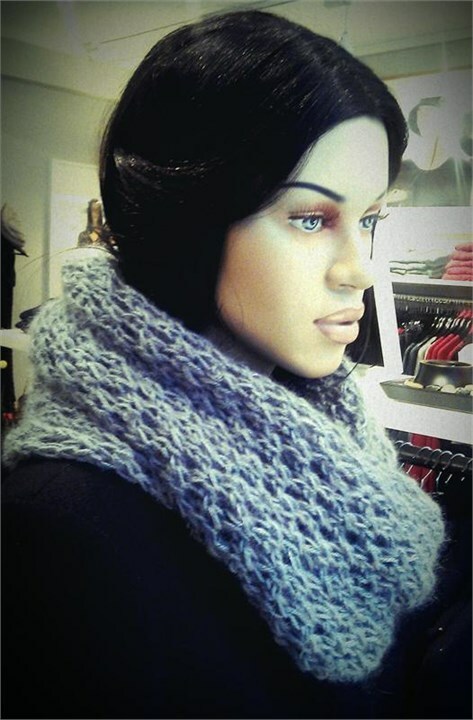 The shops are full of long circular scarfs, but most often them are made in 100% polyamide! Any amount of polyamide above 15 or 20% gives (the yarn nerd in me) the shivers! So, instead of purchasing something I don't really like, I'd rather make something I really do like! I've used two skeins of thin alpaca, and almost two skeins of very thin kid silk together. 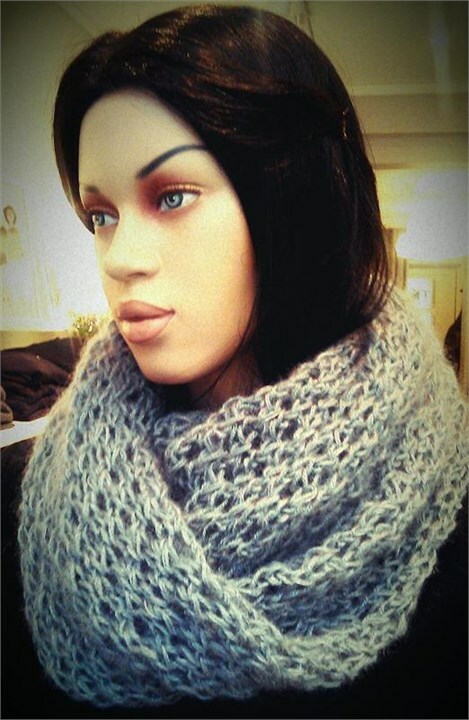 You can use any type of soft (and not too thick) yarn for this. A very soft and hairy angora or mohair would be extra luxurious! Knit on a circular needle that measures 60 cm. Needle number 7 or 8 (NB! These are not american sizes!) will be best. 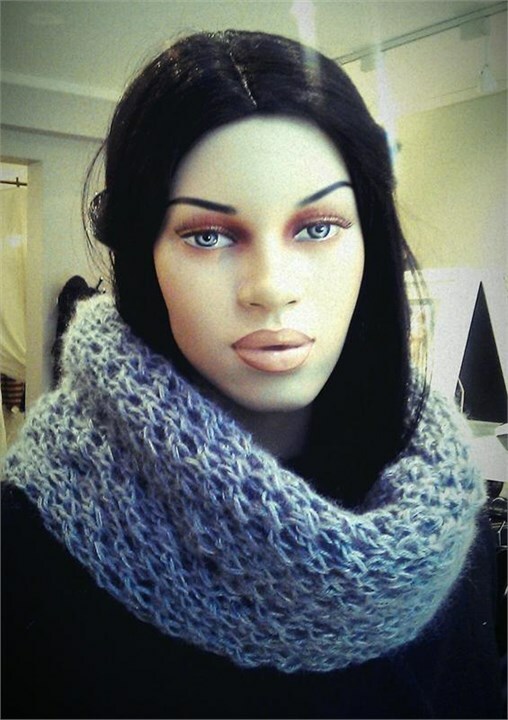 This scarf you can make two or three well spent nights in front of the tellie. 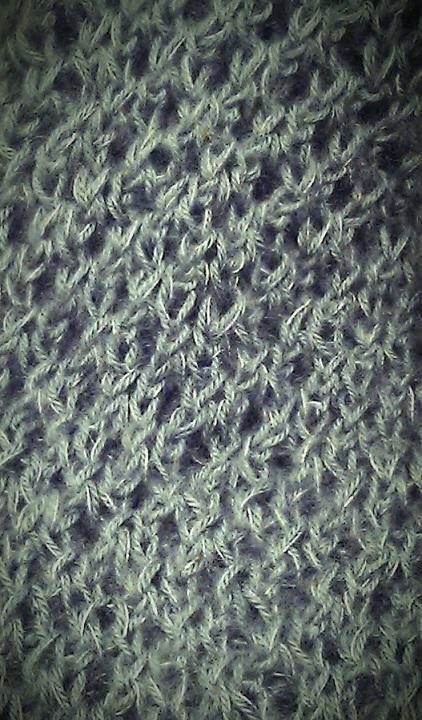 Remember to knit loose stitches all the way to make a soft and fluffy scarf. Cast on 76-80 stitches, or the amount of stitches you need to knit around. You will only use garter stitch for this recipe. Knit first round without any alterations. Repeat this every second row ( row nr.1, 3, 5, 6, etc.). Next round you knit one stitch before you start on the pattern: *knit two stitces together, cast on one stitch by putting yarn over needle from the back, knit one stitch*. Repeat all the way round. Row number 4 you start with knitting 2 stitches, and then continue with the pattern. Every second round of pattern you start with 1 and 2 stitches before pattern, so that the holes make a diagonal line! Cast off when you are finished, and sew the ends carefully together with loose stitches. Voila! Feel free to make your scarf in the length that you wish for. The amount of yarn I used was just enough to go once around my neck.